Life's Journey To Perfection: 2016 LDS Sharing Time Ideas for September Week 2: Missionary work blesses everyone. 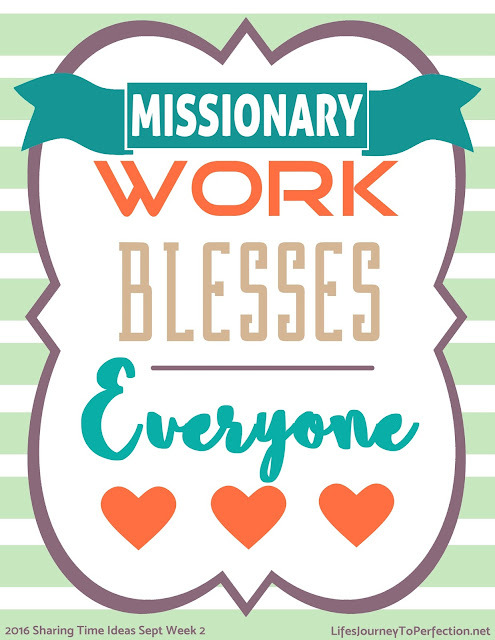 September Week 2 Topic: Missionary work blesses everyone. Do as the outline suggests and invite some guests from the ward to come and tell the primary kids about their experiences of being a missionary and/or a convert. It might be fun to turn this Sharing Time over to the Ward Missionaries or the Full Time Missionaries. Begin Sharing Time by explaining to the primary children that you have the "Secret to Happiness". Invite the primary children raise their hands if happiness is something they would like. Explain that you want to share this "Secret to Happiness" with them because it is so great and has helped to make your life happy. Explain that you are going to tell the first person in each row this "Secret to Happiness" and you would like them to share it with the person next to them by whispering it into their ear, then that person will whisper it into the person next to them's ear and so on, until everyone has heard the "Secret to Happiness". Go to each row and whisper, "THE GOSPEL OF JESUS CHRIST", into the first person of each row's ear. When everyone has heard the "Secret to Happiness", invite everyone to say it out loud, "The Gospel of Jesus Christ". Explain that the Gospel is the greatest thing that can bring happiness into our lives. Wouldn't we want to share this with those around us? Show the primary children the week's theme poster and invite them to repeat, "Missionary Work Blesses EVERYONE". Ask the primary children how they think missionary work blesses everyone? 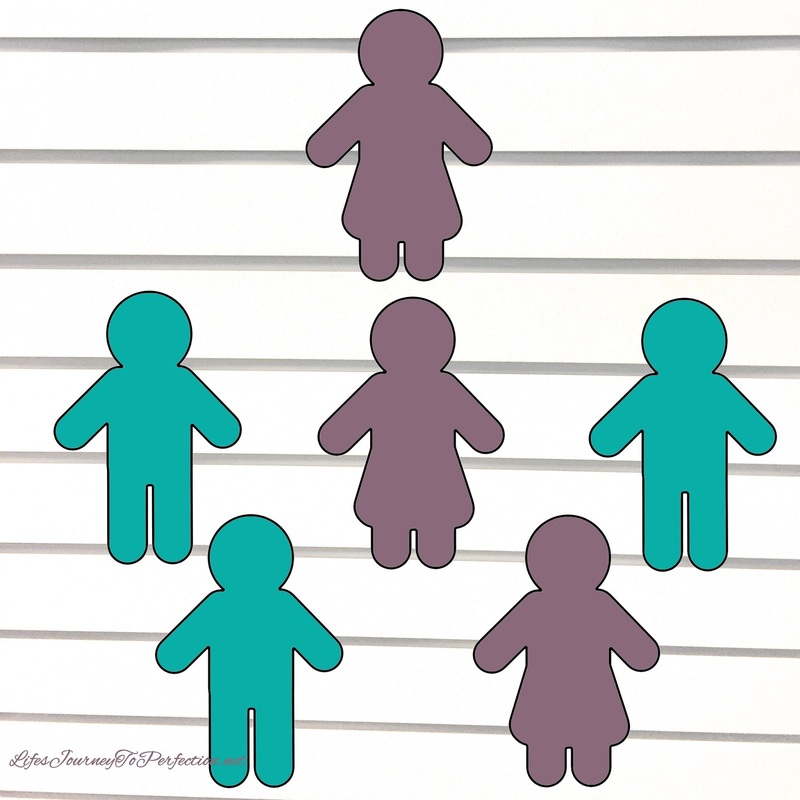 Show the primary children one of the paper cut out dolls. Explain that this person was just taught the Gospel of Jesus Christ by some missionaries. Ask the primary children, How are the missionaries are blessed from sharing the gospel? Read the following scripture to the primary children, D&C 18:15. Explain that the scripture tells us that missionary work brings us JOY. Show the primary children that one person again and explain that this one person, then goes and shares the gospel with their family. Show a few more people and put them on the board. These people share the gospel with their friends, put some more people on the board. And so on and so on. Explain that the whole board could be filled with people, just because the gospel was shared with one person. Kind of like at the beginning of Sharing Time when we whispered the secret to our neighbor and pretty soon everyone in the room knew about the great blessing of the Gospel of Jesus Christ. Invite the primary children to remember all of these blessings throughout the week. All of the blessing we have because of missionary work, somewhere in our family someone accepted the gospel from missionaries. We accept the gospel as we gain a testimony, attend church and are baptized. Invite them to think about how they can bless others as they share the Gospel with them. You may conclude with how missionary work has blessed your own life. Thank you so much for stopping by! I hope that these ideas were helpful. Below are the other topics for the month's as well as more ideas and resources. If you like these ideas, be sure to follow us on Facebook, Pinterest and Instagram for more ideas.